The Morgan Desk is adorned from top to toe in handsome, traditional details. The warm cherry finish is the perfect way to bring out the ornate bead mouldings and gorgeous rounded corners. 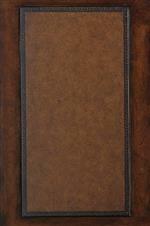 The top of the desk features a faux leather writing surface with tooled detailing. The writing surface adds a luxe, traditional feel while providing the added benefit of protecting your desk from scratches and water rings. Ample storage for office supplies and paperwork is provided by three drawer boxes and two lockable file drawers on each pedestal. The Richmond Hill Morgan Executive Desk with Faux Leather Writing Surface and Lockable File Drawers by Sligh at AHFA in the area. Product availability may vary. Contact us for the most current availability on this product. Case Detail Rounded pilasters and inverted breakfronts. Bases are either fluted legs or pediment bases. Warranty Casegoods are covered by a one (1) year express limited warranty. Sligh products with surge protectors are covered by a separate warranty and are not valid under the express limited warranty. Richmond Hill exudes the coveted, old world style of a wood-paneled library or study. Enrich your office with Richmond Hill's heirloom style. This extraordinary collection combines designs from the 18th and 19th century with modern convenience features you can't live without. 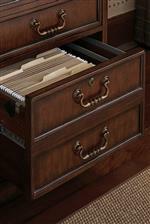 Desks and office storage pieces boast easy to access, full-extension self-closing drawers. Lockable file drawers and desks with faux leather writing surfaces add modern utility that the executive office can't live without. The Richmond Hill collection is a great option if you are looking for Traditional furniture in the area. Browse other items in the Richmond Hill collection from AHFA in the area.